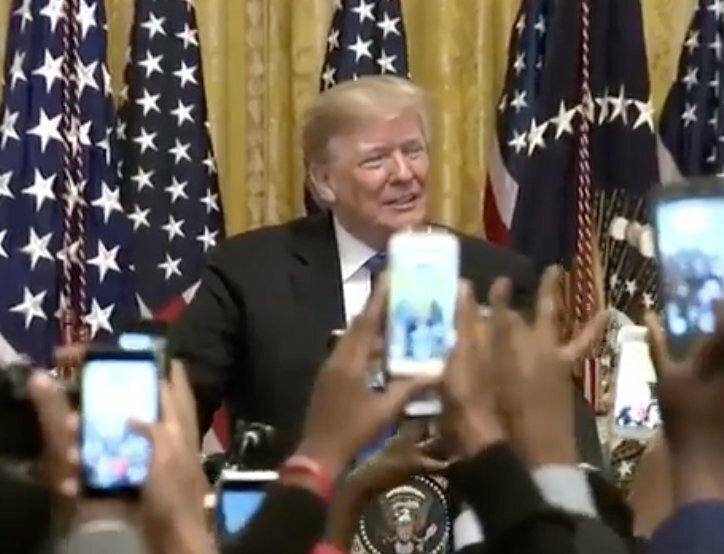 "I am pleased to inform you that law enforcement has apprehended the suspect and taken him into custody," says @POTUS in @WhiteHouse East Room, calling "these terrorist actsdespicable." 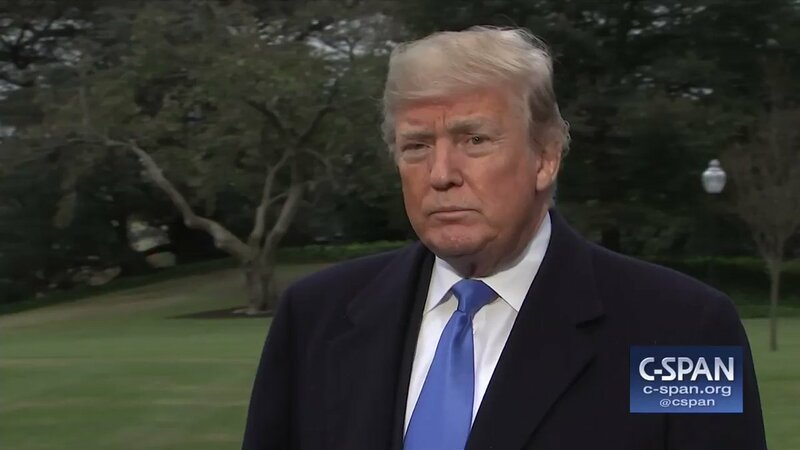 Q: "Would you yourself pledge to tone down the rhetoric for the next few days" President Trump: "I think I've been toned down, if you want to know the truth. I could really tone it up because as you know the media's been extremely unfair to me and to the Republican Party." 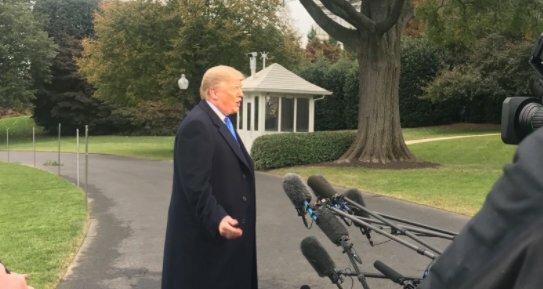 Trump: "I did not see my face on the van" of the pipe bomb suspect Cesar Sayec. "I heard he was a person who preferred me over others but I did not see that." Reporter: Will you call Obama and the Clintons [after the pipe bombs] Trump: "They wanted me to, but we'll pass." The FBI has been looking at Cesar Sayoc's Twitter posts, and his misspellings, which match the misspellings on the packages. FBI Director Chris Wray: "These are not hoax devices." [email protected]: Whether you are African-American, Hispanic-American or ANY AMERICAN at all – you have the right to live in a Country that puts YOUR NEEDS FIRST. [email protected]: I would like to begin today's remarks by providing an update on the packages and devices that have been mailed to high-profile figures throughout our Country, and a media org. I am pleased to inform you that law enforcement has apprehended the suspect and taken him into custody. [email protected]: "Americans must unify and we must show the world that we are united together in peace and love and harmony." [email protected]: "We must never allow political violence to take root in America, cannot let it happen, and I'm committed to doing everything in my power as president to stop it." [email protected]: "These terrorizing acts are despicable and have no place in our country." [email protected]: "Law enforcement has apprehended the suspect and taken him into custody." President Trump to speak about investigation into bomb packages as person is taken into custody in Florida. [email protected]: I will be speaking at the Young Black Leadership Summit in 15 minutes where I will address the investigation into the bomb packages. [email protected]: Republicans are doing so well in early voting, and at the polls, and this "Bomb" stuff happens and the momentum greatly slows - news not talking politics. Very unfortunate, what is going on. Republicans, go out and vote. [email protected]: The United States has been spending Billions of Dollars a year on Illegal Immigration. This will not continue. Democrats must give us the votes to pass strong (but fair) laws. If not, we will be forced to play a much tougher hand. [email protected]: Funny how lowly rated CNN, and others, can criticize me at will, even blaming me for the current spate of Bombs and ridiculously comparing this to September 11th and the Oklahoma City bombing, yet when I criticize them they go wild and scream, "it's just not Presidential." "The President received a briefing from Director Haspel this morning following her return from Turkey," says @PressSec in statement. "She briefed the President on their findings and her discussions." [email protected]: [email protected] from Maine is a great Congressman. He is in a tough fight against a very liberal Nancy Pelosi Democrat. Bruce has helped bring JOBS back to his State and totally protects your Great Second Amendment. We need to keep Bruce in Washington. He has my Full Endorsement. [email protected]: [email protected] will make a fantastic Governor of Alaska. Mike is for Energy and Jobs, is tough on Crime, loves our Vets and our Great Second Amendment. Mike has my Complete and Total Endorsement. [email protected]: [email protected] is doing a great job for the people of Pennsylvania. He is strong on the Border, Crime, the Military, our Vets and the 2nd Amendment. Lloyd has my Total Endorsement. [email protected]: [email protected]_Balderson of Ohio is doing a great job as your Congressman, already very respected in Washington. Get out and VOTE for Troy - we need him – great guy – has my Total Endorsement. [email protected]: [email protected] of Pennsylvania is fantastic. He is strong on the Border, Crime, the Military, our Vets and the 2nd Amendment. He is a powerful vote for MAGA and loves the Great State of Pennsylvania. Please get out and vote for John, he has my Total and very Strong Endorsement. [email protected]: I agree with their stance 100%, and the United States is likewise taking a very hard line on illegal immigration. The Prime Minister is working very hard on the economy of Italy - he will be successful. [email protected]: Spoke with French President @EmmanuelMacron this morning. Discussed many topics including the very exciting upcoming visit to Paris where @FLOTUS Melania and I will attend the Armistice Day Centennial Commemoration. [email protected]: To those in the Caravan, turnaround, we are not letting people into the United States illegally. Go back to your Country and if you want, apply for citizenship like millions of others are doing. Mueller investigated a series of meetings between the Saudi general blamed for Jamal Khashoggi's murder and Trump's first national security adviser, Michael Flynn.